Several years ago my husband and I cut our monthly expenses in half and somewhat randomly set a grocery budget of $400 a month for the two of us based on what we were spending. Now we’ve grown to a family of four and REDUCED our budget to just grocery budget of $330 a month. I’ve learned over the years that guessing and assuming when it comes to the budget won’t work. Coming up with a number for a frugal grocery budget cannot be random. In fact, it must be strategic! Here’s why: numbers don’t lie. Your income is a certain number. Your monthly bills are a certain number. The cost of groceries based on where you live and the food you like to eat are certain numbers. You can’t ignore these factors and just hope you can eat food for the month. Heavens no! 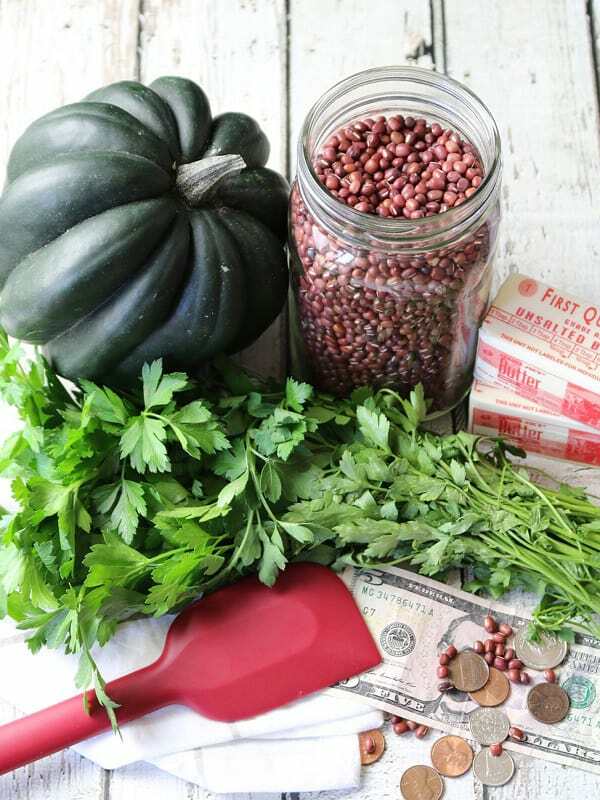 You must take into account several factors before working with a frugal grocery budget. Don’t worry though – I’m here to walk you through it! Before I jump in, I want to offer a good reason to make a frugal grocery budget in the first place: to save money. What you do with the money you save is entirely up to you. Our “one day” dream was to buy a house with cash, and you know what? We did it! Maybe your dream is to pay for your kids college so they don’t have student loans. Or save up for a new-to-you car. Or to build the emergency fund in case the breadwinner loses their job. 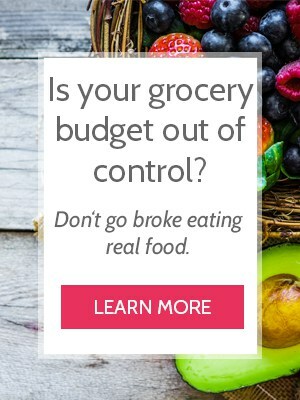 Whatever the reason, the biggest reason to make a frugal grocery budget is to save money. The secondary reason is because food doesn’t have to cost so much! When your eyes are set on the bigger prize, you’ll get creative and think of ways to get more out of your grocery budget and the food you buy with it. You’ll soon realize that you can eat VERY well for not a lot of money – but it’s all about being strategic! 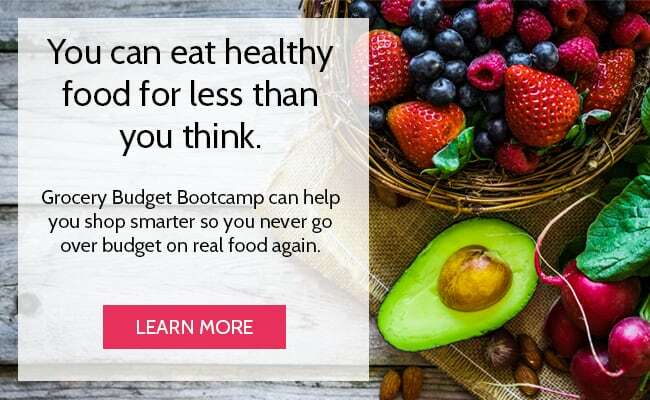 I’ve shared the exact strategies I’ve learned from the years of working within a frugal grocery budget in Grocery Budget Bootcamp. 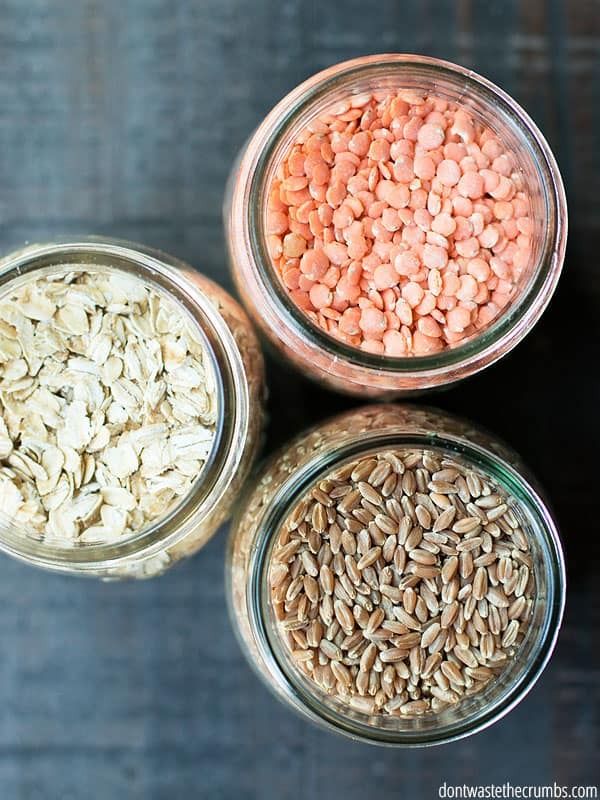 However, I want to share the basics of how to make a frugal grocery budget here because I believe it’s absolutely vital to ever feeling unstuck from the hamster wheel of real food on a budget. You absolutely, cannot, in any way shape or form, create a frugal grocery budget NOR work within a budget if you’re dead set against it. It simply will not work. So mentally prepare yourself first. 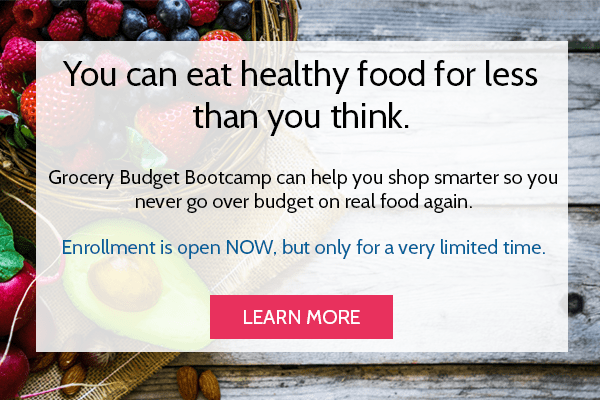 Commit to make a grocery budget – no if’s, and’s or but’s allowed. There will be a cap on your spending, and if you reach the bottom of the money jar before the month is over, you’re going to have to learn to make do with what you have. But take heart – eating well with only your pantry at hand is not an impossible task. We once went 33 days without spending any money at all. Husbands and wives need to be on the same page with the grocery budget as well. A sit down with the family to explain why it’s important to have a grocery budget, and how it will allow you to achieve your greater money goals together and stop living paycheck to paycheck. Soup nights, leftovers and meat-less meals go over much easier to manage when the family knows the reasoning behind them. This step takes a little bit more time. To figure out what you SHOULD spend on groceries, you need to figure out what you ALREADY spend on groceries. For the next month, keep every single receipt you spend on food, including dining out. We’re not going to account for that in the final budget tally, but seeing how much you spend eating outside the home is very insightful while in the budgeting process. Now be careful – you might be tempted to cheat. A tall cup of coffee from Starbucks or a bag of popcorn while shopping at Target seem harmless, but it’s still food and it still counts! At the end of the month, add up all the receipts for a grand total. This total is your starting point. From here on out, your first goal is not spending more than that on groceries. Your second goal is to lower your spending. This is the bulk of the process and it doesn’t happen overnight, so be prepared for the long haul. This is where the rubber meets the road. You want to save money? Then do it. Make the hard decisions. Skip the wants. Eat leftovers AGAIN and purposely have beans and rice for dinner. Or go extreme and spend just $50 a week on groceries. Hold yourself accountable. Don’t make excuses and just keep trying. There’s no way you can completely overhaul your kitchen and eating habits overnight. If you want the changes to be successful, they must be done in baby steps and slowly over time. When you’ve reached this point, take a look at the types of foods you spend the most money on and start there. 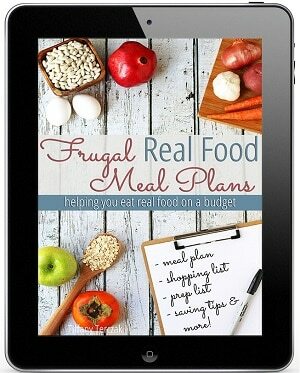 Have you made a frugal grocery budget yet? May I ask how much you spend on groceries and how big your family is? I’ll go first. For my family of 4 I spend $330/month. We spent $200 a month for my husband and I and we are in NY. When we got married a year and a half ago we decided to drastically cut back on spending since he was going back to school full time and we wanted to pay off our debt. I was inspired by a lot of posts on Don’t Waste the Crumbs! We’ve successfully paid off over $60,000 of debt with only a few thousand to go. Then we plan on saving for having kids and buying a home! Thanks for the inspiration Tiffany! We spend $650 for a family of 5 (kids are 9,6,2). We are in georgia. My goal in the new year is not exactly to cut our budget but I would like to make sure we are getting the most bang for our buck. I stopped clipping coupons but don’t may attention to sales and stock ups as much as I should. That’s a great goal Julie! Thank you for sharing! We spend $600/mo for my family of 4 for all meals, plus 3 adults for dinners only 5 nights per week (we live with my parents and adult sister). We live in southern California. We work to keep the food budget low and healthy by cooking from scratch, making my own staples when possible (thanks for the help there, Tiffany! ), and shopping sales and using coupons when possible. We can afford some organics, but I don’t worry so much about that as focusing on real foods. Our grocery budget is $450 for two adults and we live in Maine. With eating out our total budget is $500 every month. We eat organic but I still think we could get this lower which is why I’m reading this blog 🙂 When I started using cash instead of the credit card (for points) I noticed a difference. I always thought the card was the best idea since I pay it off every month and get double points, but I actually buy less stuff when I’m handing over cash… Thanks for all the tips! So glad you brought this topic up! I try to redo this process at the beginning of every year. Things change over time and so must my budget. We are a family of 5 (15 and 11 boys and 13 girl). We spend $550 per month. I have an intolerance for all grains and sugar and I have one that is dairy and gluten-free. We try to source from the cleanest places we can find but it’s getting harder to make ends meet in the grocery area. I think I’m getting lax on the snack area and relying more on store-bought gluten-free items. Time to refocus and make it work! I’m looking forward to seeing what your new e-course is all about! I have my two daughters and myself, I spend about $100 a month on groceries, but I am very blessed that we have a discount food store in my town as well as a Lucky’s market. I between the two I can pick up most foods at less than half of what the big supermarkets charge. It takes a little longer to hit several stores to fill my shopping list but I definitely love being able to feed my kids healthy food AND be able to put the extra we would have spent in savings. Thank you for the great tips, I really need to up my savings game with coupons and apps… maybe someday. Thanks for sharing Rebecca. Throwing away zero food is also my goal. I plan to retire as soon as I can collect Medicare (January of 2019) and am searching for ways to save money wherever I can. Just bought a pressure cooker and canner to learn how to can. Said a prayer that you reap lots from your garden. Well, our family is on the other end of the spectrum… We live in Colorado and spend about $900/ month for a family of six. Our kids are 2, 4, 6, and 8. I tend to buy packaged snacks for school lunches because they are convenient… But do cook most dinners from scratch. I buy organic meat and eggs, and my husband is not a fan of meatless meals… So that’s definitely an area we could trim if we got on the same page. Thanks for all the frugal living help! 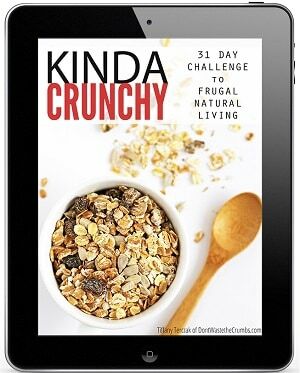 Groceries were our number-one enemy before our frugal lifestyle overhaul. Mr. Picky Pincher and I are, well, Picky eaters, so it was really rough committing to a menu and grocery budget. But we did it! We brought down our $1,000/mo grocery bill to $400/mo (still a lot for two people, but we’re working on it). We did this by planning homemade meals every weeknight, experimenting with new recipes, cooking food ahead of time and freezing it, and making our own staples (like bread, rice, yogurt, marinara, and sauerkraut). Going from $1,000 to $400 is amazing, nicely done! I am going to be very honest, and I hope no one judges me. Each year I recommit to having a good budget for groceries. I am able to do it sometimes, but right now I would say Yikes! We both work full-time, and are gone all day. My husband is gone about 12 hours. The kids and I are gone about 9-10 hours. Some nights when I know my husband will be late I take the kids out to eat. My grocery total for December is $908. That does not include any cash purchases or any eating out (and believe me, we ate out). About $150 of it is for local, pastured meat. I do try to get my meat that way; I buy much meat at the grocery store. I do love to cook, but it is hard after working all day. Also, my job requires a lot of at home work too. My family will eat breakfast for dinner, but soup is not the most popular thing. I do like this blog and have gotten some good ideas in the past. Looking for ideas to get organized, budgeted and healthy for 2017. I am off this week, so I can get started. We need lunches for work and school, so that includes cold cuts. Also, we do buy snacks. Not sure what else to do. Help. That should read ” I don’t buy much meat at the grocery store”. I give props to the working moms out there! I’m a “stay at home” mom of six and this is our first year of the kids attending school opposed to them being homeschooled. Wow, life is busy! The kids attending school has totally throw me for a loop. While homeschooling has its trials at least I was home to throw something in the oven for dinner. Lunches were much easier as they could fix them themselves, fry an egg or make a snacky plate. With three kids dairy, nut and gluten free school lunches are tough and expensive and 15 year old boys are hungry. I too need to reign in our grocery budget, get more organized and plan better. I have never kept track of what we spend, terrible I know. If I had to guess $1200 a month, that hurts to write. We carry no debt so we have it to spend but really eating up all our $$ is not a great plan 🙂 Here’s to 2017 and controlling the grocery budget. So nice to see what you all are doing. My husband and I have 5 children (ages: boy 8, girl 7, girl 4, girl 3, boy 1.5). So with a family of 7 we can see a low grocery spending of roughly $1100 and a high of $1400. I need/am committing to lowering this bill. A question I have for you is what should be the goal? 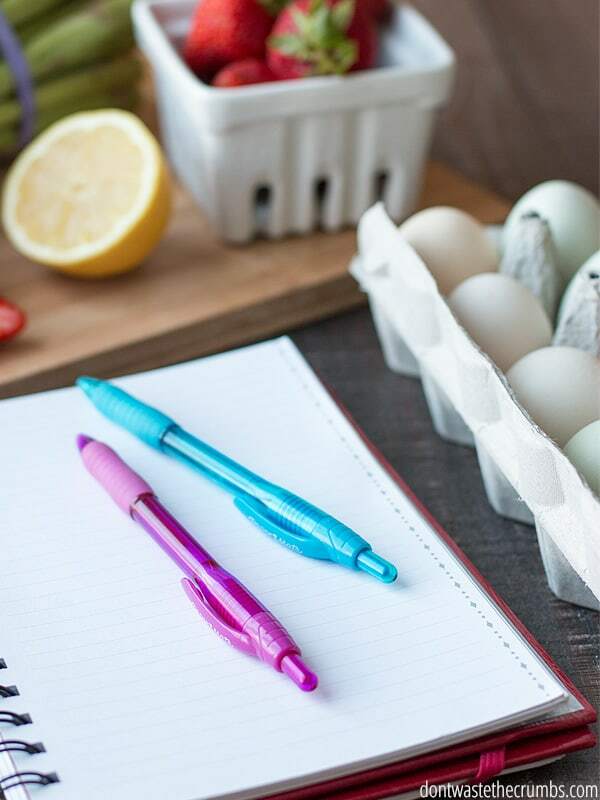 You wrote in your 22 days to a fresh start worksheets, that Dave Ramsey says we should be spending only 5-15% of income on groceries, is that the goal for a family our size or a family of 4? Where and how do you budget for things like toilet paper, paper towels, cleaning supplies, shampoo, conditioner etc. I’ve been doing a lot of research on budgets and it seems like when people talk about grocery budgets it’s just food. Where does the rest fit in? You would create a separate line item for these items Lindsay. Personally, I budget once/quarter since not everything needs to be purchased once/month AND most things I buy to DIY cover more than one batch. I’m just new to this page, so far i’ve loved what i’ve seen. I look forward to learning more from you. Since 16 October, 2016 I came home from the grocery store and my cupboards were too full, so I told my Husband that I quit grocery shopping until we run out of food. He thinks i’m crazy but agreed as long as we were aloud to get fresh milk and eggs, the rest was fine. So we’ve bought eggs and milk for the past 3 months with a grocery budget around $15 per month. We try to cook supper every day, and i’m lucky he’s ok with meatless meals. Although where we live it is common to have meat stored in your freezer from the butcher, So we have 1/4 cow and 1/2 pig to go through before we have to go completely meatless. I also grow much of my own veggies so I like to think we were not spending too much on food. we have plenty preserved (i’m going to try lactofermentation this year!). I garden and this year i left my Kale and brussels sprouts growing, and harvested them until mid Dec. when we had our first deep freeze. (i’m also learning this year about winter gardening, these were completely unprotected, maybe if they were protected then i’d still be eating fresh Kale!) We haven’t had any truly fresh veggies at home since then. I’m starting to be anxious for spring growing season! We spend $400 a month on food only for 2 adults and 3 teen boys. We do foster care so the boys get free breakfast and lunch at school. There is always breakfast foods here but they would rather sleep! We menu plan and eat or repurpose leftovers for dinner. I cook from scratch 95% of the time and we rarely go out to eat. We have a soup and sandwich night and a breakfast for dinner night every week. I have a price book and stock up on things when I can under a separate budget category that is allowed $25 per month. It works well for us! Having a category for stock-up or monthly sale items sounds like a good idea. We are trying to switch from weekly trips to monthly. I don’t know if that will help decrease the total or not, but hubby wants to change. I have been tracking our spending for two months, and for the two of us, we spent $399 and $353. Some of that was stocking up on food that was on sale for really good deals, but we haven’t eaten yet. We could use a lot of those groceries without really stretching the budget. I just need to get into meal planning better. I really like having a stock up category in my budget. Some months I use it all and sometimes a portion rolls over to the next month. Some examples are butter at $1.68, asparagus at .99lb, and ground beef at $1.99 lb. Those items bought in bulk will serve us well for more than a month. Wow!! I am impressed. WE are a family of 6, 3 of which are teenage boys. My cost is around $1000 when I am being good. My goal was to start trying to get it down to $750. I will see how that works and then go from there. I definitely have thingns that are pricy that I can cut. 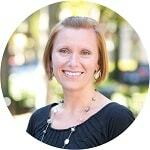 This blog and your post inspire me to put my head down and make it work. 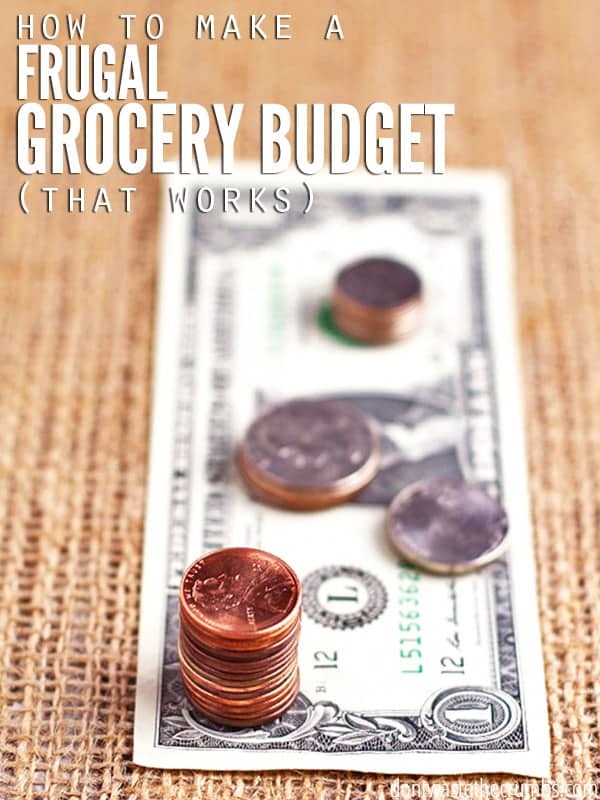 These are some great grocery budgeting tips! Grocery expenses have been one of my biggest struggles in sticking to my budget. Once again thank you for the tips! I am definitely pinning and sharing! Our key for saving money on groceries is buying in bulk. Especially things like toilet paper, shampoo, etc. When they go on sale at Costco, we’ll load up on six months to a years worth of them. That makes figuring out our budget a bit difficult since we buy things at varying frequencies. The key requirement is that you have to have enough storage space to take advantage of bulk buying. Are you including supplements in your grocery budget or is that separate or don’t you take supplements? I have always taken supplements as part of the grocery budget. A lot of food even organic does not have the nutrition value that it did 20 years ago. Allen – I take 3 supplements currently, collagen, maca and fish oil. These come out of a separate category, since they are more of a fixed budget item than not and we consider supplements more of a medical thing than food thing. But our supplement budget is relatively new – we didn’t use supplements until about 6 months ago. I live alone and I’m scared to even think about how much I spend on going out to eat in the city and ordering delivery (I can get pretty much anything I want delivered to my home — not just pizza and Chinese food. I’m talking Morton’s steaks, Cheesecake Factory, Thai, Ethiopian, etc.). I don’t really buy groceries, because sometimes it seems like a waste of money to cook for just one person, as many items can only be purchased in bunches, I’m too busy, and because I’m always eating out with friends and/or colleagues. However, these are basically excuses for me to avoid eating leftovers. I’ve given up alcohol which has saved me a lot of money, but I’ve still got work to do. I love your last line Nikki – that’s how we feel about food and debt too! I am a grad student who spends $400 a month on just me! I’m really inspired by this blog and have been searching for concrete ways to get down to my goal of $200 ( with an extra $200 going to student loans). Thank you everyone for sharing, and for this post! You’re very welcome J – welcome to the community! Tiffany, you may or may not see this comment as it is a year since this post, but I wanted to let you know it’s still helpful! We’ve had some changes in our finances and have needed to tighten up our food budget considerably. My husband is anxious about this but I feel confident that I’ll make it work so that we don’t need to turn to credit cards this winter. Thanks for your continued inspiration! Do you resources include wheat and dairy? We are mostly gluten and dairy free (and we only eat a few legumes – but not often). I’d love to use your resources to save on our budget. Can you advise which ones I’d gain the most from? I don’t know where I’m going wrong. I’m almost to ashamed to say this but this is the first time in my life I’ve tried to do a budget. I’ve been out of work since Jan 30. I have a new job but have no idea when I’ll get paid (I haven’t started yet). My 21 yr/old son lives with me. We are REALLY trying to do the ketogenic diet which means 20 carbs or less per day. So, I have lots of meat, eggs and cheese. I suppose these are some of the most expensive things at the grocery store. I started with a month I had a job (obviously) and figured that we spent nearly $850!! I’ve not figured any other month yet but I will probably in order to get an average (ish). Oh and I bought a new car last June. If I’d only known!!! I had no car payment prior to buying the car. My first goal will start the day I get paid. I will not spend more than $600 the first month. Goal will be 400-500. One thing I guess I have to give up is buying bulk? I’m not sure. But I like getting a bargain anywhere I can. Forgot to mention we live in Oklahoma. Yes, one of the fattest (if not THE fattest) states. When you say Groceries what do you mean? I always include cleaners, supplies and dog food in my “Groceries”. Should I be making a separate budget for these things? Many moons ago I used Quicken software and separated the categories. Right now, I don’t have Quicken or time for that. I have my grocery money set to pay for everything except dog food. If I buy soap, shampoo, and shea butter on one receipt, then I dump in personal care category. The idea is to set a budget and keep it. I started tracking my spending on food this month and I am absolutely gobsmacked by the results.We are a family of two adults, a dog, a cat and an occasional homeless friend who pops in weekly. My food bill is over $ 630.00 per month plus another $112.00 eating out. I shop at discount stores and try to eat mostly organics. I can’t believe I am spending this much on food. The only thing I can think of is I like to experiment with ethnic foods.So I have a lot of spices according to what country I’m craving for the week. Last week it was experimenting with Seitan. This week it was Persian gormeh szabzi. I even cut way back on meat this month and yet, my food bill seems astronomical. I thought I was very frugal but apparently I’m not when I compare myself to the people on this site. Another wild card is my vegan brother whose belly never seems satisfied. He stares in the refrigerator looking for some nonexistant foodstuff. Help!